Little runaway, I was flyin'"
Tom Petty’s 1988 Classic was today’s playlist ‘eargasm’. If I could dance and ride at the same time I would have. Tom popped up while I was rockin’ the Heritage Classic around the delightfully named hamlet of ‘Woongoobla’. It's situated in the coastal corridor of cane fields and prawn farms that lie East of the M1, between the upper reaches of the Gold Coast and the Southern Bay-side Suburbs of Brisbane - and it’s actually not bad riding country. It is coastal-plains-flatland, but there are some good corners to be found and some nicely empty back roads running through the cane. The posted speed limits aren’t stupid-slow either. The late morning temperature was already well into the 30’s by the time I wheeled the Heritage onto the M1 near Loganholme with light winds and clear skies prevailing. I’m still quite surprised by just how comfortable the new model is. For those that don’t know me, I’m 6’5” or 195cm in the new money and big. I can get by with a stocker, but normally I need a Harley ‘Extended reach’ saddle on a Road King or Street Glide for optimum comfort. Even on older model Heritage Softails I was pushed a little closer to the handlebars than I’d ideally like by the big bolster that separates the rider and pillion accommodation. All easily fixed with a visit to the accessory catalogue of course, but so far, on two reasonably decent rides, I’ve been perfectly comfy on the new model throughout. No need to change it at all. The legroom is really good too. I could stretch out ‘tres’ comfortably on the big footboards on the way home and the mini ape handlebars work to complement it all very well. Lounge chair comfort. My daughter’s first comment after watching me pull into her driveway for a quick visit this morning was “That looks really comfortable”. The point is it will work for us big units, conversely, shorter inseams will have no trouble flat footing it with its 680mm saddle height and they should be even more luxuriated. The only thing I’d change to suit the taller gent is get a slightly taller – or shorter - windscreen. The buffeting at helmet level isn’t too bad, tolerable, but shifting the dirty air up or down a few inches would make the ride and ergos absolutely ideal. Normal height riders should fit nicely in the bubble. I’ll remove the screen entirely for the next ride – it only takes seconds – on or off. It's a very comfortable bike. I headed up some back roads through the mangroves out to Rocky Point - getting ‘close' (well ... sort of) to Adventure bike-type riding conditions and the Heritage was as sure footed on the busted up tarmac as it was on the sweepers - and had a few quick ‘blats’ up the dirt cane roads for good measure. I used to be able to bottom out the suspenders on a 103cube without trying too hard – even after going through the rigmarole of beefing up the preload. On the new one Harley says it has used “sophisticated suspension technology … racing-style cartridge forks and high performance mono-shock rear for dynamic cornering capability”. It’s still a foot-boards cruiser-tourer though. The lean angles are a Heritage’s: 27.3 and 28.5 degrees. If you ride it anywhere near its handling capability on a typical roundabout the foot-boards will hit the deck. It’s a Heritage. But the sweetest-riding one I’ve yet encountered. I zigzagged back through the cane, headed out to Jacob’s Well for a photo stop, did a bit more back road-ing and a highway jaunt back to Stapylton - with a quick stop at the Gem Hotel. I stopped at the Pub for a Coke on a hot day, but mostly because there were already three Heritage Softails parked in the shade by the side door. Two of them were travelling together and two of us were there by happenstance. After a quick chat and Q&A session I was back on the M1, cruise-control dialled in and seriously digging some torquey-smooth sweetness. Just as a BTW - the photos in the ride reports all came from my Canon G5 X.
I VERY happy with it as a ride report device. 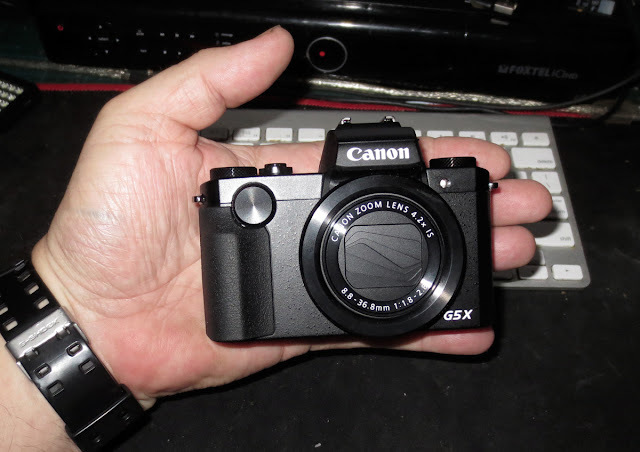 It is very compact, but takes a good 20mpx shot with an F1.8 lens. 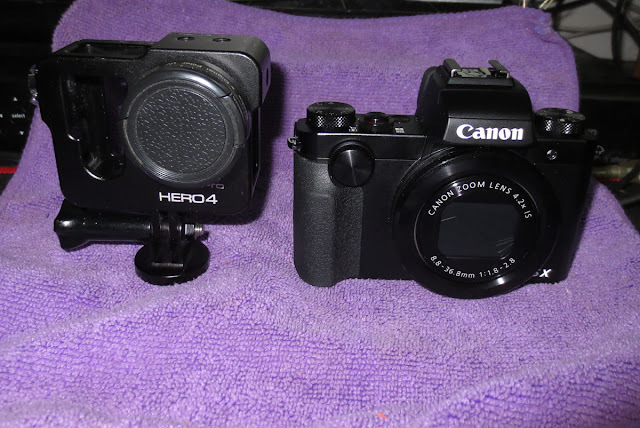 It's not great at action shooting speed-wise, but for blogging it's excellent. Unless it's for print work I leave the big guns at home now. Oh my God, Dave, that is one of the best, most interesting reviews I’ve ever read. I can’t wait for more. It feels so bizarre that in all my years of riding, I have never been on a Harley. There’s a lot of misunderstanding and stigma associated with the world’s most popular motorcycle brand...as agricultural equipment. When I fly places, I often rent a bike instead of a car and for sure one thing to come from me reading this, is next time I’ll rent a Harley. Damn, you sure can write. Very kind Chris - thanks - as you probably guessed they are Blog posts for the mag's page - I still look at them and see plenty of 'grammaticals' though. Why we have sub-editors! And yes - a lot of what you read about Harleys online is somewhat removed from the reality. The critic's biggest gripe seems to be their owner's fashion sense and what they wear, rather than the viability of the vehicle. It really is about the right tool for the job. If I was going on a tour of New Zealand I wouldn't choose a Harley. If I was riding from Melbourne to Perth it's one of the best choices. I Don’t Want To Go Home. As I was nearing the Storey Bridge quite late on Monday night the first few bars of 'Southside Johnny and the Asbury Jukes’ 1976 Classic “I don’t want to go home” seemed more than entirely apt as it was ringing in my earpiece. The roads were empty, the Brisbane night was balmy and I was enjoying the bike far too much to consider garaging it – one more lap! I spent some of the day running a few errands and part of the evening looking for photo locations with the Heritage in Cruiser mode. It only takes a few seconds to remove the screen and it makes quite a difference to the way the bike looks - and feels. It actually tempts me to ride it a bit harder with nothing but the handlebars between the wind and me. It feels like there is less of it to chuck around too. To that end, throttling the 114 is very rewarding. This unit has a few thousand K’s on the clock now and it’s loosened up enough to give it a decent pinning on the on-ramp and post-apex exits. It’s very easy to live with. For a stock motor it delivers satisfying power, enhanced with a 155Nm-strong torque screw. It runs out of breath somewhat beyond max power, due to the restrictive exhausts (necessary for compliance these days), but fit those Stage-one pipes, stick a tuner in it and it would be quite a weapon. It’s no litre Sportsbike, but that’s not to say it lacks hurry-up in standard form. Some mods would give it nicely longer legs - easy. The standard tune motor is also very tractable around town. It will sit on 60kph in top gear without lugging or complaint - or shaking like a paint mixer. Rowing the 6-speed gearbox up and down in heavy traffic is sweet and the mechanically actuated clutch didn’t get heavy or bind through a few hot and humid Brizzy afternoon snarls. The EFI was also faultless in conditions that may have seen the earlier Heritages develop the odd splutter. The locking leather-finished hard bags proved useful for carring tripod and sundry other kit on my rounds. Harley lists their capacity at ‘0.043m3’. I’d list them as ‘medium’. They’ll fit a jacket and some wet weathers per side. Serious days-on-the-road touring would need a rear rack/pack rack as well. For the around town jaunting I did today they were quite adequate. After I’d done my afternoon’s work around the Moss Street bike precinct I took the long way home via Wellington Point and a photo call. The styling of the bike has grown on me and taking the screen off made it look more like an old-school Heritage – albeit with modern accoutrements. Of which, the unique-looking Daymaker Headlights are quite brilliant – literally and figuratively - and in a departure from the previous setups the switch for the Driving lights is now on the LH switch block, rather than behind the fork leg – it took me a few minutes to find it. One thing I think that could be done better style-wise is the number plate – it sits upright on the rear guard and the illumination panel faces upwards from the taillight. I’m sure there must be more elegant solutions in the aftermarket. Otherwise its looks are starting to sing to me in increasing volume. Like ‘Southside Johnny’ as I was stylin’ around the CBD late on a Monday night.